Android Phone Driver, Google Android Devices, Android apps, Samsung Android Driver, HTC: Additional 125GB of storage for your Android and FREE! Additional 125GB of storage for your Android and FREE! Recently I speak here of how to using Dropbox to get about 2 GB free storage for your Android accompaniment, which can grow if you invite some people and end up making an account, up to m axi m or 8 GB Free, also can do with a Pro account for 50 or 100 GB by paying a monthly or yearly. But what concerns us today is how to get 125GB (which is pretty) Completely Free. The solution is to use the Microsoft Windows Live SkyDrive , which only by a user of Windows Live offers 50 GB free storage that meets our needs and storage of images, videos, documents (word, excel, powerpoint, notes text) or audio recordings and music, as the only "catch" is that e l load size is limited to 100 MB per file. 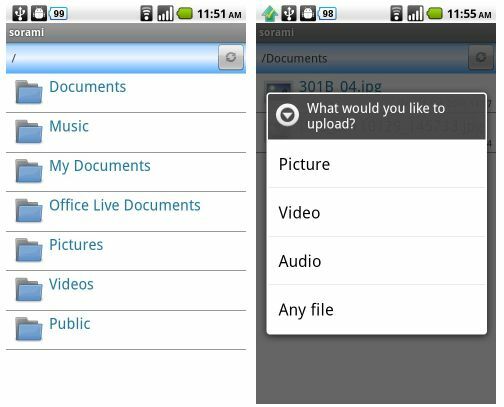 The web access from our Android browser is complicated and even more is uploading files, that's where it comes into play SORAMI (A client application to SkyDrive ) which completes the combination that will give us the precious storage capacity. This application allows us to access our "Virtual Hard Disk" and all its contents, and can explore or get off the stored files and of course upload files from your smartphone. Although yet to be polished, and finished as synchronized with the "Photos" or "Favorites" is an app that is on the right path, and in its latest update added support for multi-accounts, with up to 5 accounts, which leaves us with 125GB of storage capacity in the "cloud", but you have 5 valid accounts live. This is another app that turns into "Must Have"